Graham Ford, the Sri Lanka coach from South Africa, has said that Thisara Perera reminded him of former South Africa allrounder Lance Klusener. 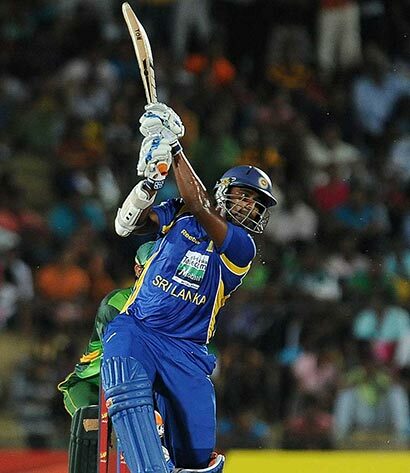 Perera’s outstanding performances with the ball in the ODIs against Pakistan earned him the Man-of-the-Series award. “The way he hit the ball the other day he reminded me very much of Lance,” Ford said. “He is only 23 and is going to develop and get better and more effective. The more times he handles situations the better he will be. He is a wonderful striker of the ball and he’s got the same sort of power that Lance had. He is an all-round cricketer just like Lance and contributes in all areas. Klusener, reputed for his big hitting in the late stages of an innings, was a left-hand bat and right-arm medium-pace bowler like Perera is. Perera has already developed a reputation for being a finisher with the bat in ODIs. He took 11 wickets at an average of 15.54 against Pakistan which included a hat-trick in the fourth ODI, making him only the fourth Sri Lanka bowler to achieve the feat after Chaminda Vaas, Lasith Malinga and Farveez Maharoof. Ford had earlier said that Perera, who has been selected for the upcoming Tests against Pakistan, could establish himself in the Sri Lanka Test side. Perera, whose performances helped Sri Lanka take the series 3-1, said he had done some bowling drills with Champaka Ramanayake, the Sri Lanka fast bowling coach. “I have been selected as a bowling all-rounder so my first priority is as a bowler,” Perera said.